Heidi Meier from The Day Spa in Shoreview, Minn., won an Instagram-based contest created by Gina Silvestro (right) with a full set of stiletto nails at the Akzéntz booth. The winner of Silvestro's Instagram-based contest also had the choice of receiving an Akzéntz Pro-Formance starter kit. 1. 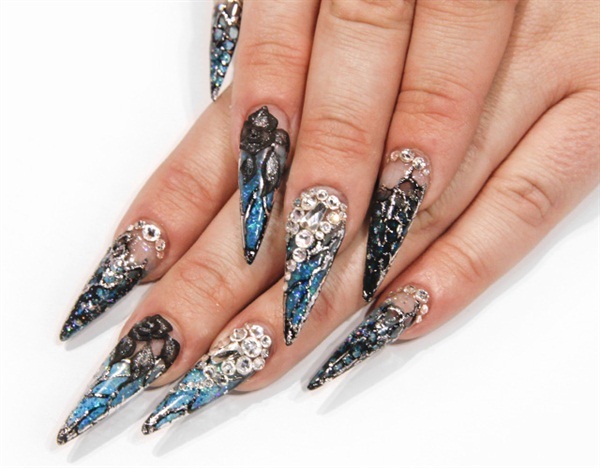 She pinched a normal form to sculpt the stiletto nail with Akzéntz Pro-Formance Enhance hard gel. 2. Apply Akzéntz Options Aurora Blue. 3. Apply Akzéntz Options Clear Blue over the Aurora Blue to add dimension and to make the blue pop. 4. Using the Akzéntz Art-02 detail brush, paint the design with Options Gel Art Black, flash-curing in between. 6. Apply Options Sparkles Aurora Silver and cure. 7. Cover the whole nail with Akzéntz Pro-formance Ultra Gloss gel top coat and cure. 8. Add black 3-D roses using Akzéntz’ Gel Art Powder. She mixes the Gel Art Powder with Options Gel Art Black. (Click here for a video of Silvestro mixing the Gel Art Powder with different Optionz Gels to create 3-D roses.) She uses the 3-D Gel Art brush to sculpt the roses. 9. Place crystals on the nails. 10. Apply gel top coat to the entire nail, then cure. 11. 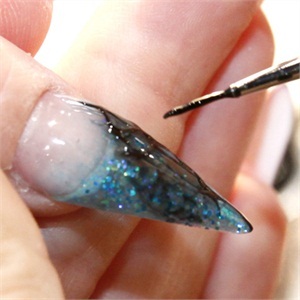 You can apply gel top coat around the crystals to reinforce them if needed. For more information on products, visit www.akzentz.com. Silvestro also plans on creating more Instagram contests for future shows, so follow her here: www.instagram.com/gelessentialz.